power at home to cook or charge up their devices, farmers have it extra hard. What happens when farmers lose power? a greenhouse or hoophouse full of sensitive thirsty seedlings. Or if you need to wash a bunch of carrots and beets out of storage for delivery this weekend. no heat in the greenhouse or high tunnel. Unless your system runs completely on propane, which is doubtful, no electricity usually means chilly temperatures in heated growing spaces. Even if the furnace is propane burning, the thermostat and circulation fans etc are all electric. 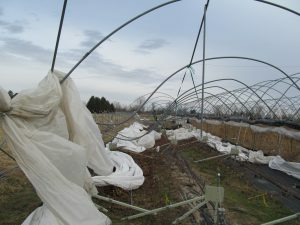 no inflation fan (or squirrel fan) keeping your double poly greenhouse plastic nice and taught. 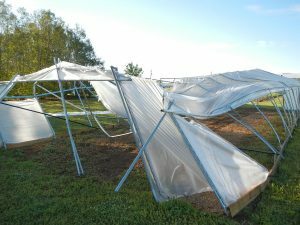 Double whammy: flabby plastic + high winds = much higher chance of plastic ripping/tearing/leaving the farm. I reme mber preparing for an oncoming Hurricane a number of years back. I was new to having a greenhouse on-site. My intuition was to open it all up and let the wind blow through. But just to make sure, I called my greenhouse supplier, Atlas Greenhouse, and asked them. Well, in this case, I couldn’t have been more wrong. The wise industry folks told me to do the opposite, close her up as tight as possible. They said if the wind got inside, the chances of the whole thing getting lifted and flying away increased dramatically. Hunker down is the best advise of all. But what if you can’t really seal up the whole structure tightly? Well, then, that’s a whole other story. Here’s what happened to us a couple years ago. I had a high tunnel with roll down side (love ’em), gable end louvers, and a door at each end. Because we were cheap, we didn’t buy the endwall pre-made from the manufacturer, because we could make them cheaper ourselves. Sounds good….until the design to keep the doors shut and plastic covered fails. You know what happens then? Right, the wind opens the door, the wind rushes in full force and has to get out somewhere, so it busts right through the side wall – ripping the plastic up out of the wiggle wire. So much pressure, that air has got to escape somewhere. So, which is it? If you really can’t batten down the hatches fully, then leave the sucker wide open! But extremely well anchored. Otherwise, it’s Mary Poppins, and off she blows down the lane. Make back up electrical generation a real thing on your farm. Either figure it out yourself, or pay a professional to make it as simple as possible have the power switch from Power Company to home made. Decide which things you really need to keep functioning and have them already hooked up to the new panel. Yep, it’s expensive. But so is replacing dead plants, dead greenhouses, dead tunnels, and all that plastic. Ugh. When you decide to DIY instead of buying the factory made whatever-it-is, do a good job. Otherwise, you’re wasting your time and resources doing not-quite-good-enough work.